Like the idea. Should we call it dawgbook ? I’ve been helping coach my sons baseball team. It’s 10-U so it’s fun because they don’t claim to have it all down and are very coachable . Except one kid, he knows nothing but claims to know it all. Every team has one . I help coach football also but I’m here to tell you, nothing like watching your kid get a game winning hit. I did my best to remain calm but for sure was a proud dad! Good idea @tfk_fanboy! What does "I train bjj" mean? Normally I google it if I don't know it. But I was confident I was speaking for many in this case. How about telling the meaning behind the username. Ghost bro,Rpm and Orlando bro’s come to mind. I will start. Mine are initials and race number from back in the day. @JRT812 mine is initials also. Let's decide on a name for this thread @RPMdawg and I'll change to your liking. 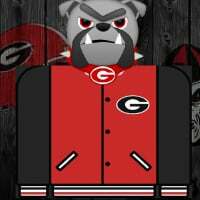 As far as my username, I let you guys do a little Uga history. Hint, the first bulldog mascot for UGA and his given name....Fun start. Geez...My Bad...it is up to @tfk_fanboy . Some reason I was thinking you were the OP. Guess we'll leave it up up to him..lol! She probably just wants to get you nekked again and do things to your body. There's always some kind of catch to it.